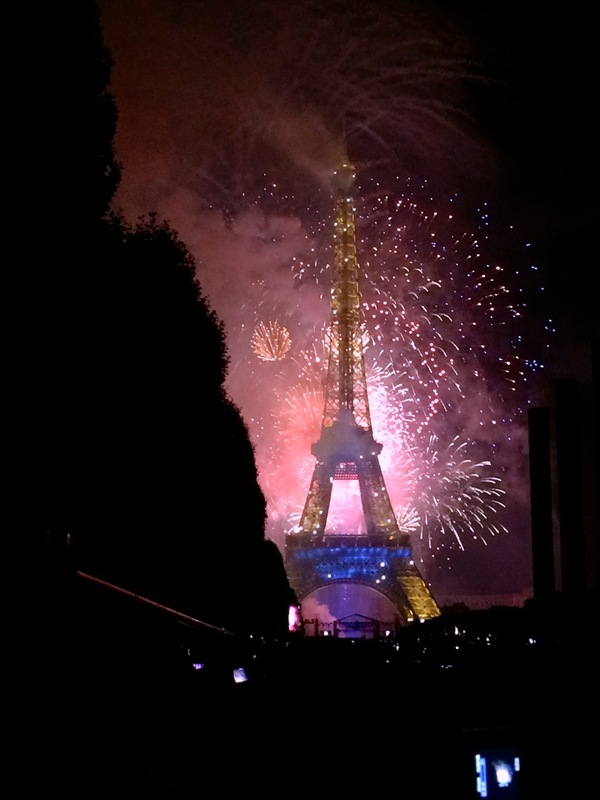 The fourteenth of July is La Fête Nationale, but more commonly known to us as Bastille Day. 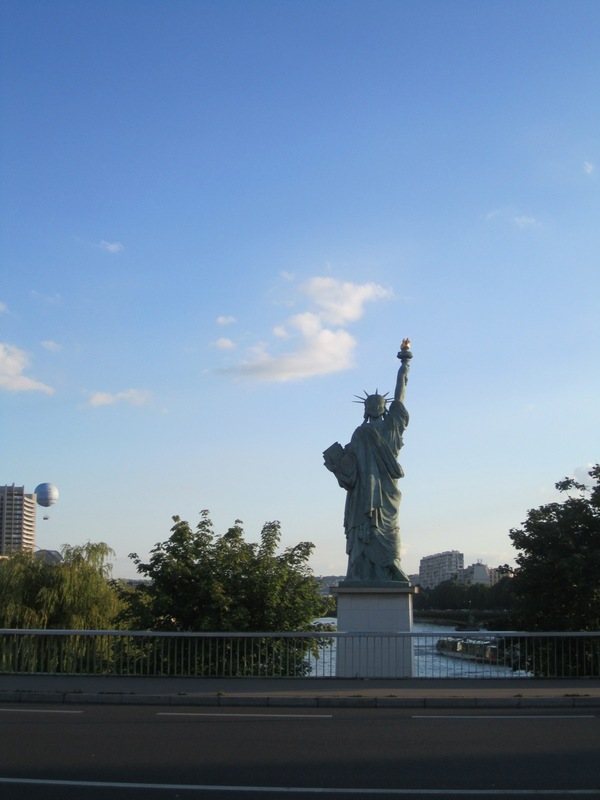 This is a day of celebration for France — like our Fourth of July in America. It commemorates the storming of the Bastille — a massive prison — and the beginning of the French Revolution, which didn’t end so well for Marie Antoinette. I love that show. Smart and hilarious. I highly recommend you watch it. There’s nobody like our Édith. She had such a voice. If I could have lived in the past as I want to, I would have loved to see her in concert. Her and Eartha Kitt. And Judy Garland. Those shows must have been swell. When my alarm went off, I was quite willing to go right back to sleep, but I forced myself up. 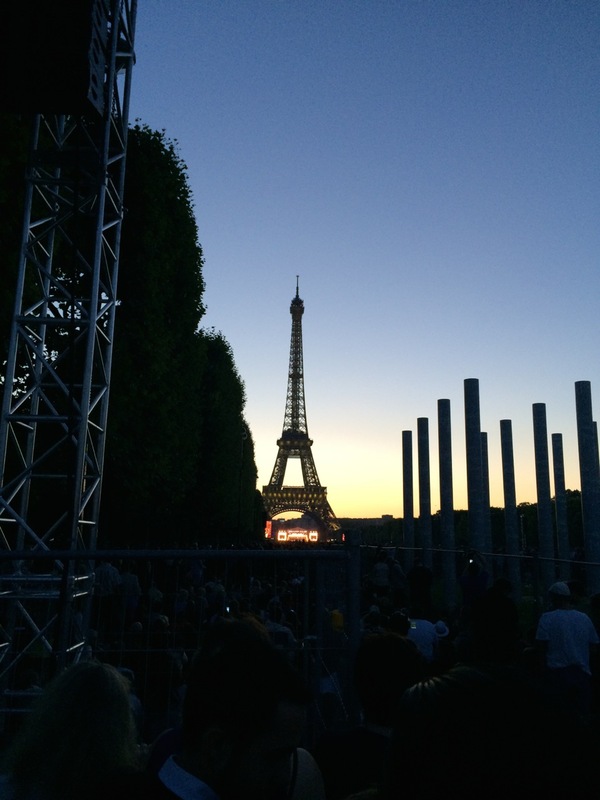 How often would I be in Paris for Bastille Day? Who do I know that’s been to Bastille Day? I don’t now anybody that’s been, so it immediately makes me more interesting. Begrudgingly, I put on pants and roused Jessica and after a lot of grumbling, we were out the door. We didn’t make it to the Champs-Élysées in good time. So, we couldn’t really see all that much of the parade. We did see some horses clopping by on a side street. We wandered around and finally found a place were we could see a bit and then President Hollande went by on a chariot and that was interesting. 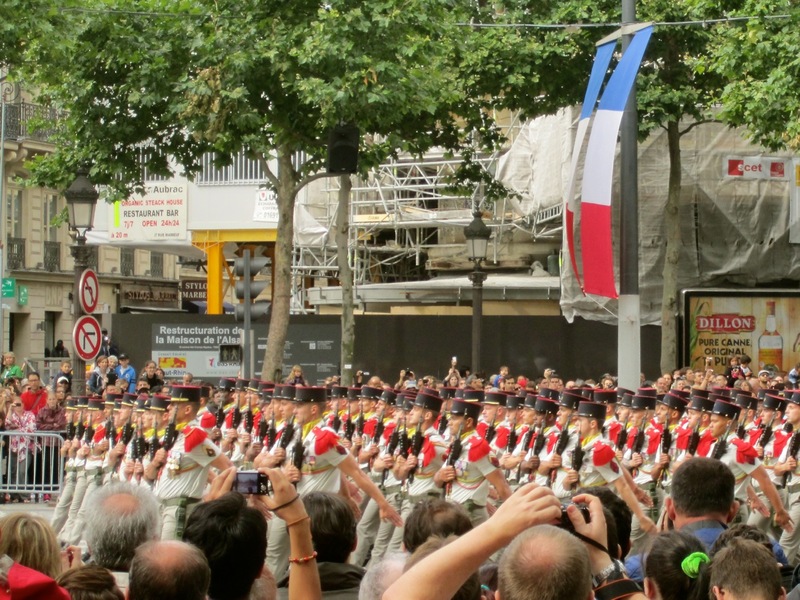 A terrible picture of the Bastille Day parade. I had to pretend it was interesting, but reader, that was a great struggle. I’m not big on parades and this one went on for two hours. Two mind numbing hours of the exact same thing. A military brigade. A military brigade. A military brigade. A tank. A tank. A tank. A military brigade. A nuclear warhead. Finally we couldn’t take it anymore, so we tried to get out of the area, but that was no simple feat. 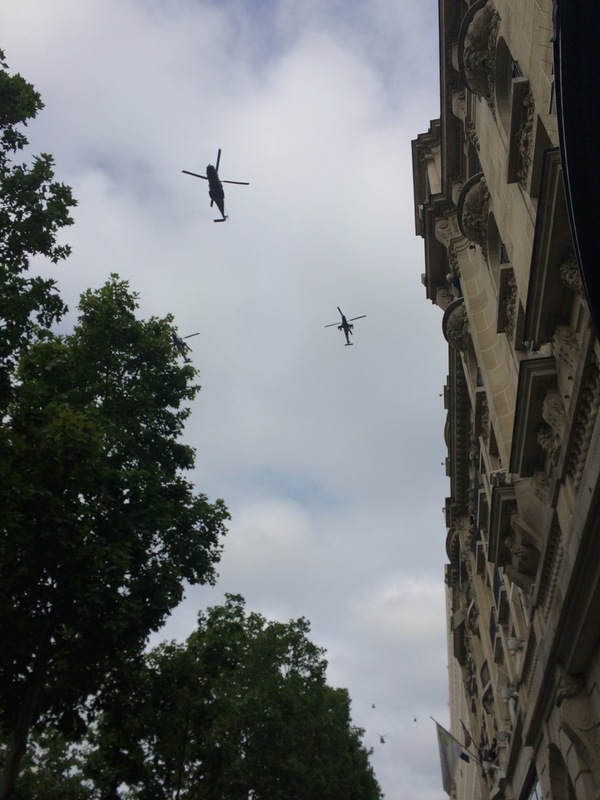 Helicopters were swarming around everywhere, which was rather odd, but it was part of the parade. I found it slightly threatening. I’m not big on violence, you know? So, armies and navies and marines and troopers and all that just make me slightly wary. We were starving to death, but none of the trains we needed were running, so we had to walk all the way to Iolanda’s. We walked an awful lot on this trip. I hope I lost loads of weight. I had Kir for the first time at the restaurant. It’s an old French drink. You take a liquor of some kind like blackcurrant, peach, or raspberry, and mix it with white wine. The liquor sweetens the wine and it’s just lovely. Kind of like drinking a light alcoholic syrup. I had the peach kind and I adored it. It reminded me of this Japanese plum wine called Umeshu that I adore and get at World Market: I’ll have to introduce Kir to my liquor cabinet when I get home. And I’ll have to get more Umeshu. It’s so tasty with tonic water. Jessica didn’t want to go to the fireworks AT ALL. I tried to get her to go, but in retrospect, it was a very very very very very good idea that she didn’t. I don’t think she would have handled it very well. The trains were awful getting to the Eiffel Tower, so I got off a few stops early and leisurely made my way down to the Seine. 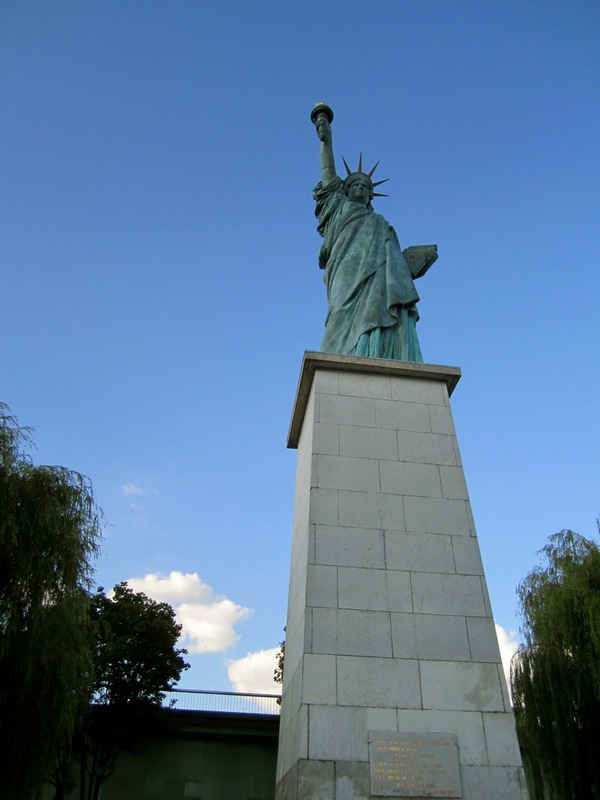 I’ve always meant to go to an artificial island called the Île aux Cygnes where there is a scale model of the Statue of Liberty. I finally saw it and what a strange sight it was in the middle of Paris. 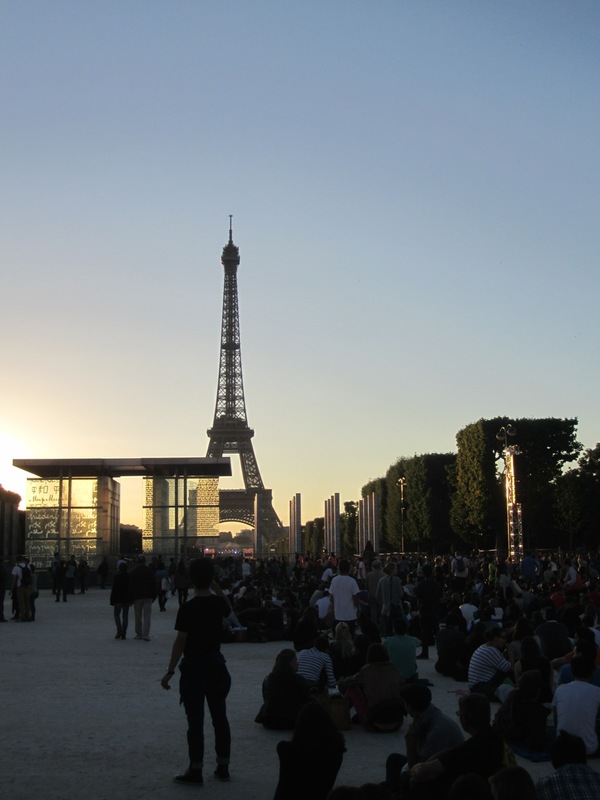 There was also an absolutely stunning view of the Eiffel Tower, and if I had any sense at all, I would have plunked myself down with my book and waited for the sun to set. But no. It wasn’t all that crowded, so I thought I’d go look at this park that I’d read about down the street aways. 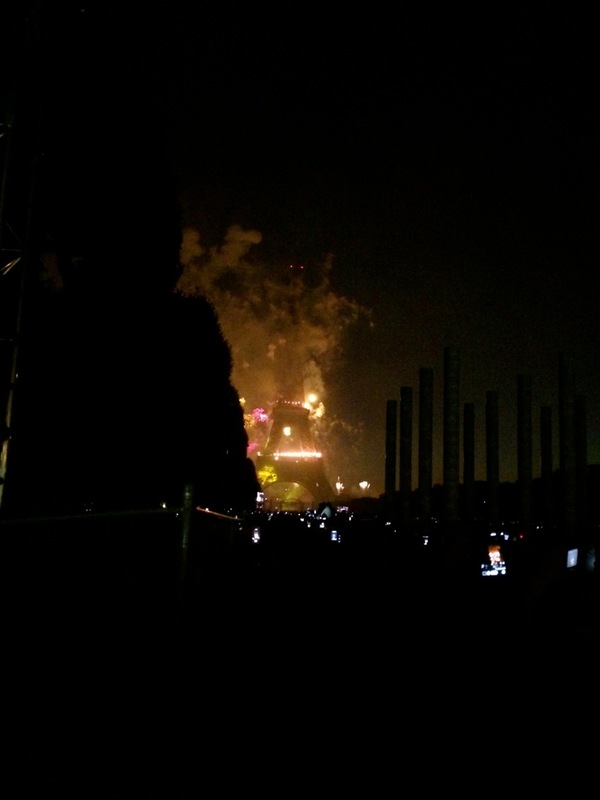 It was one of the “SECRET BEST PLACES TO SEE THE FIREWORKS” or that was title of the email I was sent. It was an endless walk down there, but the view wasn’t all that extraordinary. I wanted to be able to hear the music and from this distance you couldn’t hear anything at all. 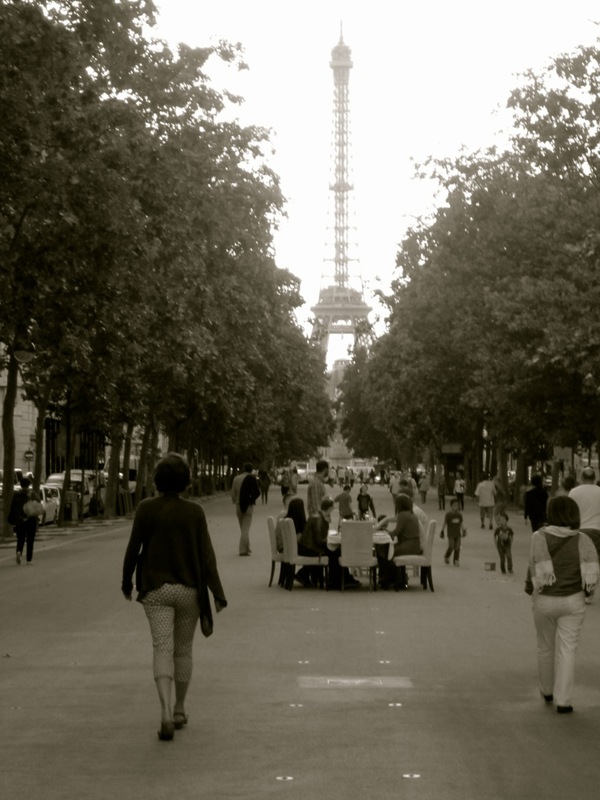 So I decided to walk back to the Champ de Mars. I passed these very clever people on my way back who had brought a table and plush chairs and a dinner service and a full meal to sit and watch the fireworks. Oh, they were so classy — how I envied them! It was rather charming and I appreciated that the French were so cultured. Back home we would have played some top 40s music while drinking beer and yelling about immigration. I wouldn’t have. I don’t drink beer and I welcome immigrants. The crowds were horrific. 500,000 strong was the estimate. I’d say more. In front of me was a woman who decided she was going to film the entire evening on her iPad. So, she held it above her head and filmed and filmed and filmed — nothing really — it didn’t make any sense and several people asked her to stop. I understand snapping a few pictures, but when people don’t stop at events like this, I start to take issue. Like people at concerts. LE SIGH. Then a man who was just as tall as me stood in front of me. How annoying. I hated him. People must hate me. The singing reached a crescendo and finally it was time for the show to begin! Reader, I’ve honestly never been more alarmed by a pyrotechnic display. This year’s show was in memory of those who died in the Great War — our World War I — and it was absolutely horrific. It was made to look as if the Eiffel Tower was under aerial attack. The orchestra played the most chilling music. I would have sworn that Hitler had risen from the dead and decided to ambush the city. The tower was on FIRE. There were explosions. I was in awe…but not out of pleasure or delight. I couldn’t get over the idea of how horrible it must have been to be in a bombed city, like when London was bombed. How terrible it must be to have destruction rain down upon you that way. Of course good triumphed over evil at the end and the conclusion was much cheerier, but I’m still haunted to this day by that introduction. But at the finale, the true nightmare began. I’ve been in huge crowds before. I’ve been to the Royal Wedding. I’ve been to huge outdoor celebrations. Crowds are nothing new to me, but this was a spectacular crowd. You couldn’t move but an inch at a time and it was so dark. We were like a school of fish being twisted and directed by the current. We stopped traffic. We wrecked motorbikes. Finally, I escaped from this crowd and went to the RER, only to find it closed. Typical. I walked to the next RER, only to find it closed. Typical. I walked and I walked and I walked my size 12 feet off until somehow I was on the Champs-Élysées again by the Grand Palais — that’s no simple walk reader. I was basically lifted by the crowd through the entrance and into the Métro. I waited for one train, we pushed and shoved. I didn’t get on. I waited for the next train. I PUSHED AND I SHOVED. I didn’t get on. I waited for the next train and was physically lifted up and put on the train. It was jam packed. It was filled with over enthused youths and sloshed elders. It was also four thousand degrees. What felt like an ETERNITY later, I found myself back in Clichy and finally back in the apartment two and a half hours after the last firework had exploded. Such fun. With complete exhaustion, I collapsed on my bed and slept. I’ll watch it from home next time. 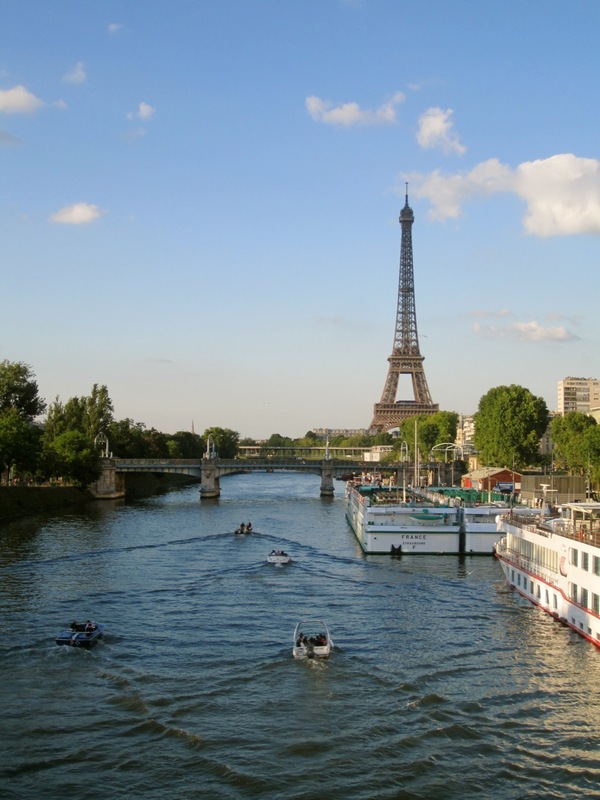 ← PARIS: How Easy Is That?